A very unconventional hotel, El Ganzo has catered for all types of travellers. Could El Ganzo be Mexico’s coolest hotel? The artists have taken full advantage of the hacienda-white walls (photo: Steve Madgwick). 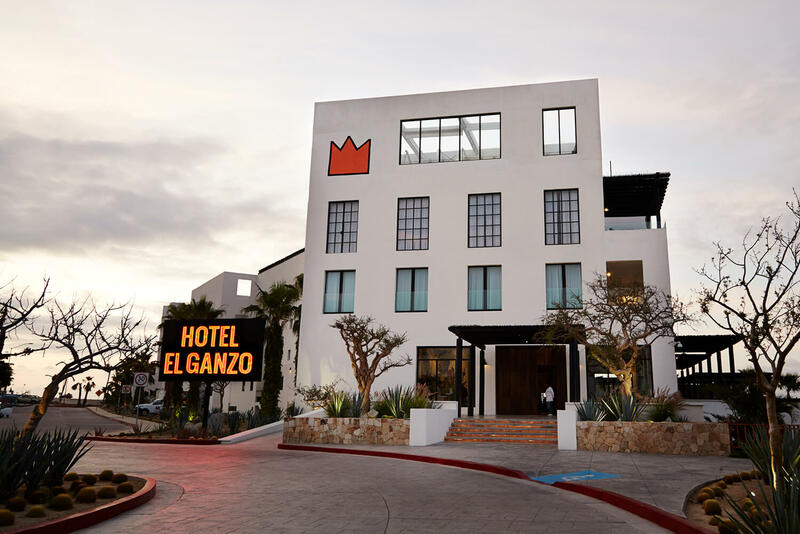 El Ganzo houses its own recording studio, inside the hotel. Rest your head in a contemporary modern room. 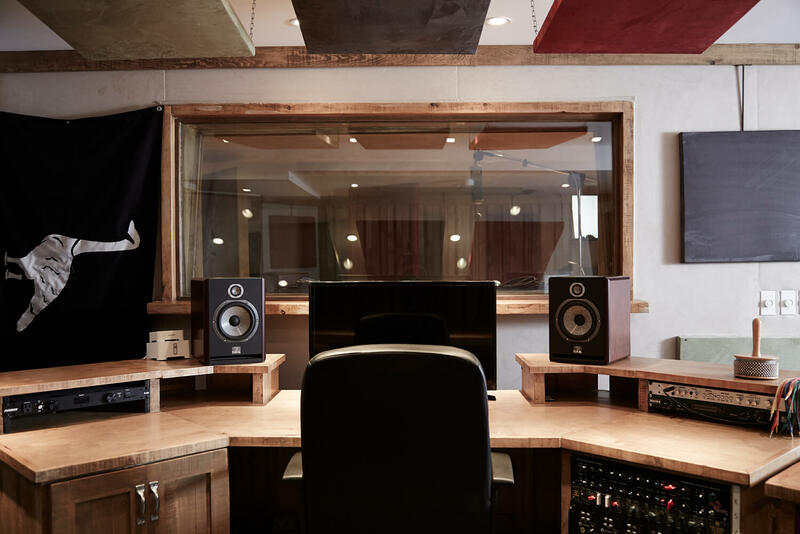 There are a fistful of hotels around the globe that have their own recording studios, but you would never know it. Ganzo trumpets the idea. If your stay doesn’t coincide with a musical guest, the pick of the ‘El Ganzo sessions’ are on loop on your room’s TV. 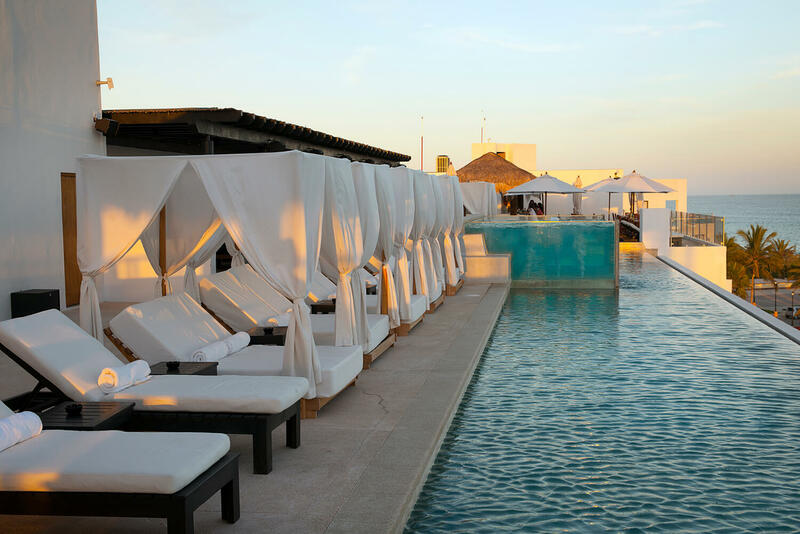 Relax in the sun on the roof of the El Ganzo or take a dip in the the simmering infinity pool. Sometimes, to stand out in a sea of loud voices it’s best to lower yours. Better still, why not speak an entirely different language? How else to describe an unconventional hotel in very a mainstream Mexican holiday hot spot that has its own recording studio and a two-storey Stormtrooper mural that threatens to blast the infinity pool into last millennium? 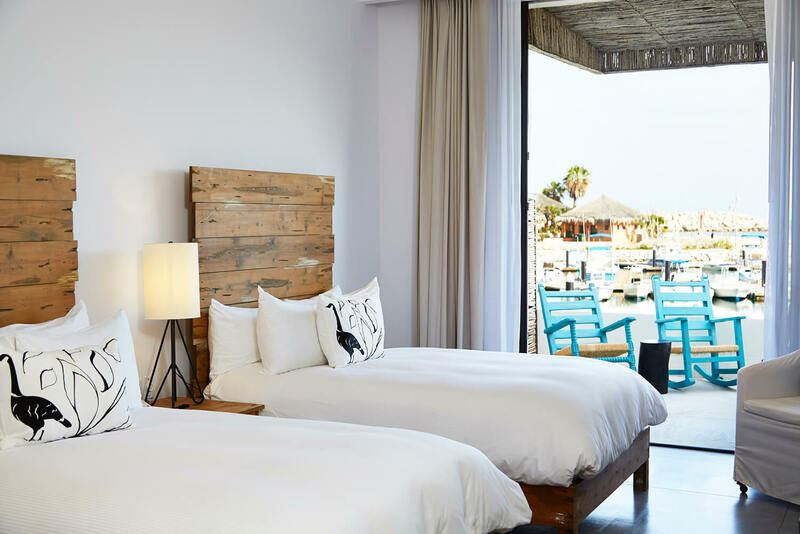 Hotel El Ganzo sits on the periphery of one of West Coast USA’s go-to long-weekend playgrounds, the famed Los Cabos, at the party, pointy end of Mexico’s Baja California peninsula. Some say this is the Mexico you go to when you don’t go to Mexico. It’s just a two-hour flight from LAX, and way more affordable than any North American equivalents (also two reasons why an increasingly amount of LA-transiting Aussies are heading here). First, some context on this desert-by-the-sea resort town(s), lest you think that it is just a Mexican Kuta; all noise and no substance. 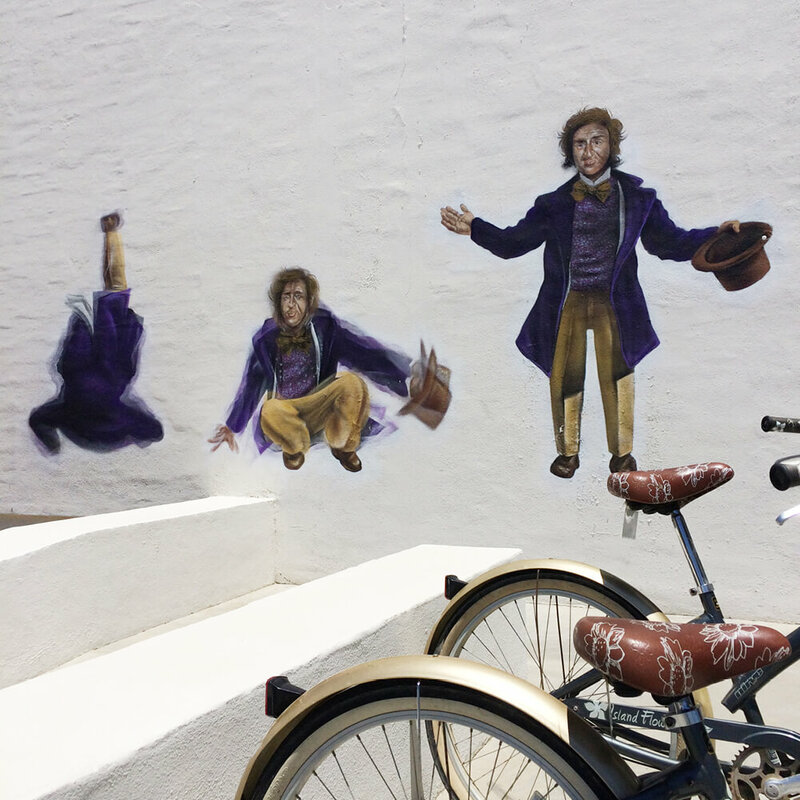 Los Cabos is a destination of two not-quite-equal halves: the thumping clubs of party zone Cabo San Lucas on one side, and the old-town-square charm of the less (but still) touristy San José (del Cabo) on the other. The towns stand 30 minutes’ drive apart, although they’re slowly meeting in the middle, along a coastal tourist corridor which is incrementally being gobbled up by a slow-motion avalanche of sprouting hotels and resorts (yep, you really want to get here soon if you’re going to do it). El Ganzo (The Goose) sits all by himself on San Jose’s port (Puerto Los Cabos), away from the spotlight, surrounded by a little fishing village of around 2000 souls, La Playa (yet still in striking distance of Cabo San Lucas, if you fancy a tequila-fuelled night on the tiles). The 70-room hotel is Los Cabos’s self-proclaimed epicentre for contemporary art and music. Does it pull off this borderline arrogant claim? Well, there are a fistful of hotels around the globe that have their own recording studios, but you would never know it. Ganzo trumpets the idea. 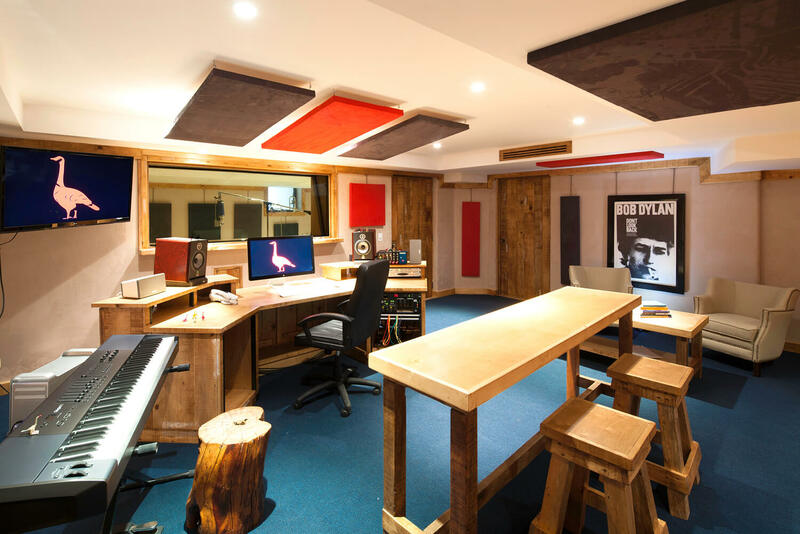 While you can’t transcend from karaoke virtuoso to recording your own album here just yet, you are more than welcome to have a look at the uber-cool basement complex, accessed through two secret-vault-like heavy wooden doors set into the floor. Indie, folk and pop groups and solo musicians travel from all around to write and record music (by invite of music director Mark Rudin), and just to hang out for a week or two. And from the ‘what else is in it for me’ file; once they’ve finished being all creative, expect a rather intimate live performance on the rooftop bar/pool for guests. You’ll more likely see independent and up-and-coming artists here, the likes of Australia’s own Atlas Genius, than the likes of Katy Perry (although she “almost” used the studio recently to listen to one of her new recordings, thwarted by a last-minute schedule change, apparently). If your stay doesn’t coincide with a musical guest, the pick of the ‘El Ganzo sessions’ are on loop on your room’s TV (see El Ganzo’s YouTube channel). The artist-in-residence philosophy is even more obvious visually. The hacienda-white walls are a blank canvas for worldly creatives, who usually crash for about a week to do their thing. Which explains the two-storey Stormtrooper (by Mexican urban artist Andrik Noble) that graces a huge wall on the rooftop bar; a bold move for a space that visually already has a lot going for it. There are plenty of statements like this at El Ganzo (curated by Luzma Moctezuma); literally starting with the four-part Willy-Wonka-roll welcome mural (from the scene where Willy first emerges from the chocolate factory limping) to the giant ‘Whoosh’ as you ascend the elevator shaft. There’s no self-aggrandising, self-righteous attitude, though; this is accessible art, and so are the artists. As part of their residencies, the precocious visitors hold classes for San José’s children at the nearby community centre (the hotel also facilitates permaculture classes using lessons learned among the lemon tea, cucumbers and eggplant of the kitchen’s garden). So Ganzo’s got cool covered, at least outwardly, but what about the comfort and cosy, the actual hotel part of the hotel? The stripy-couched, four-poster-daybed rooftop bar is the place to be. Its infinity pool, which lazily overlooks a marina and the Pacific beyond, has a ‘fishbowl’ plopped in its centre. The see-through and raised Jacuzzi is a touch strange at first sight, seeing magnified butts flopping around inside, but if you can get over that, it’s a fun centrepiece that complements a lively area. Across the harbour, a couple of minutes by the hotel’s boat or a 10-minute leisurely cycle around the harbour shore on one of the complimentary beach cruisers, you will find the private beach club. Which is perhaps the most underwhelming part of the El Ganzo experience. Sure, it’s a nice place to flop on one of the hammocks tied between palm trees, charge a margarita back to your room, and go for a swim in a sheltered bay. However, the setting and views are just a little unremarkable and harbour-like, especially when you compare it with other parts of this coastline and indeed other beach clubs in Los Cabos. 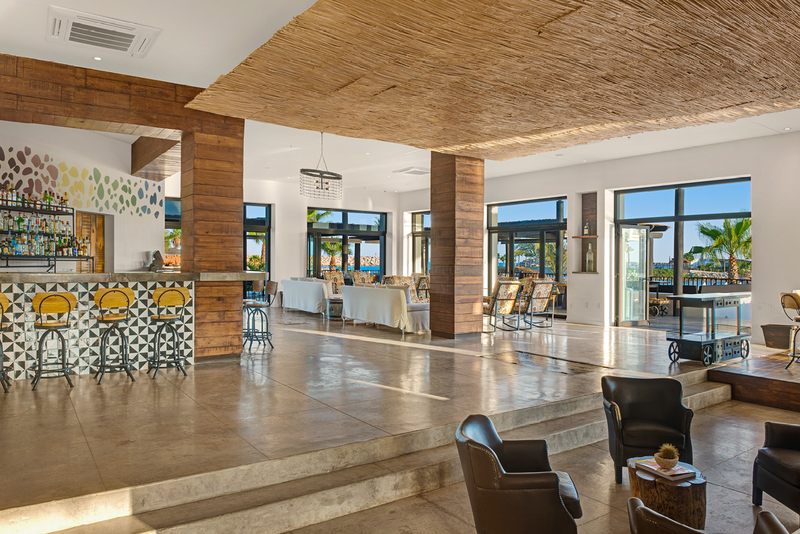 The diverse mix-and-match furniture and fittings in the rooms breathe a laidback Baja vibe. 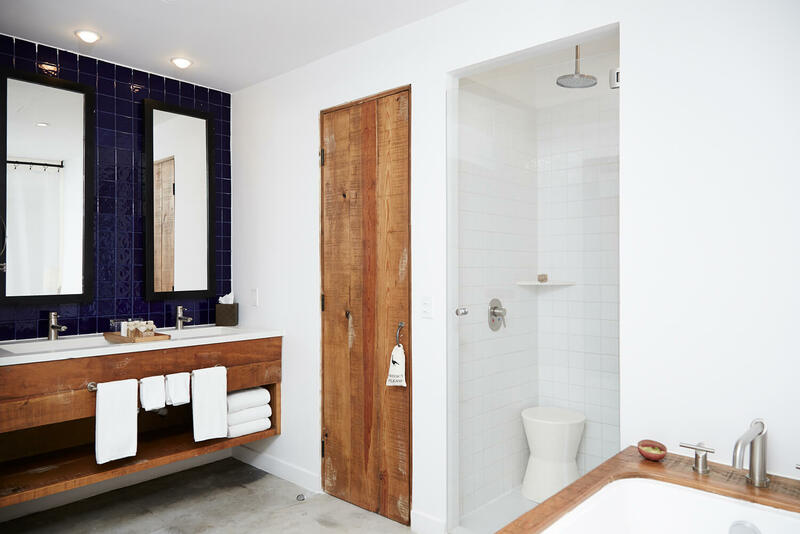 Rough wood, polished concrete, and generous standalone baths help make them a modern, bright and breezy home-base. There are a few could-do-betters: the wooden front door within a door looked the part, but kept knocking the key out of my hand when I went to open it, and the posts from the four-poster bed obscure the telly (when you’re lying in bed trying to watch it). Overall, my room could have used one or two more playful touches to keep it in step with the bubbly public-space persona. But this is just five-star nit-picking about a place that makes an artful attempt to stand out from the crowd and does a lot of little things very well (and very differently), from the sportily-attired staff right down to a subtle sustainability focus, using biodegradable drinking straws for example. The food options are also plentiful, fresh and distinctly local. Pretty damn good for a place that was absolutely pummelled in Hurricane Odile, which blasted its way through Los Cabos in 2014. El Ganzo re-opened 14 months later, in 2015, and used the disaster as an excuse to refine a few things the owners didn’t like about the place anyway. Another maxim goes that you can judge a hotel by its clients. Unlike many, if not most other hotels in Los Cabos, a high percentage of El Ganzo’s visitors are locals: hip, young, creative Mexicans. Exactly what ‘The Goose’ is really.